The last week in April always feels like old home week in New York’s mystery community. For the Dell mystery magazines the festivities began on Tuesday, April 25, when our two Readers Award winners, Paul D. Marks and Doug Allyn, and Amy Marks and Eve Allyn, joined us for afternoon tea in our offices on Wall Street. It’s a rare year when the Allyns are not in New York for the Edgars (though they were absent and sorely missed in 2016), but for Paul and Amy Marks it was a first experience of the Edgars and their first trip to New York City in a very long time. Witnessing others’ excitement exploring our city always gives me a thrill, and reminds me of how fortunate we are to have so much of our “industry”(though the word sounds wrong) centered in one place. For one thing, it means that during Edgars week we can meander from the various parties to informational events such as the MWA Edgars Symposium to the awards banquet, all by means of short subway rides. Following our Tuesday tea, for example, we hopped the 2 train to Otto Penzler’s Mysterious Bookshop for a party amidst the towering shelves of one of the country’s most comprehensive stores devoted to crime and mystery fiction—a party jam-packed with authors, agents, and editors. On Wednesday, associate editor Jackie Sherbow represented the Dell mystery magazines at the MWA symposium at the Grand Hyatt, and then it was on to the big day, Thursday, April 27! 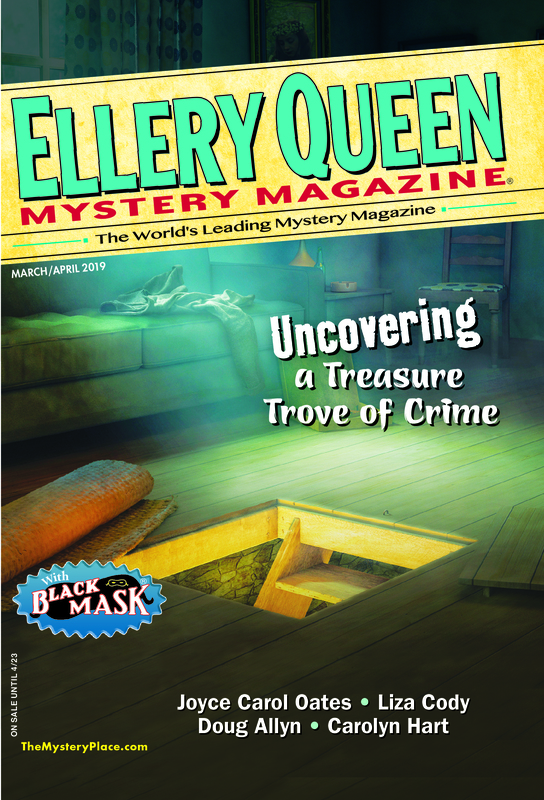 Each Edgars Thursday afternoon, the Dell mystery magazines host a party in honor of the EQMM Readers Award winners, the Edgar nominees, and the Robert L. Fish Award winner. This year (as in 2016) the party was held at the Library of the General Society of Mechanics and Tradesmen, the second oldest library in New York City, founded in 1820—before the appearance of the fist modern detective story (1841), Poe’s “Murders in the Rue Morgue.” As a setting for a literary event, it can hardly be beat, but what makes this event most special is the number of old friends of the magazines it draws together each year. In this thirty-second year of the EQMM Readers Award, and thirty-first year of Readers Award parties, we still saw a few faces that have smiled on us at nearly every one of the previous parties. There were also some notable newcomers at the party, as there are every year, including this year’s winner of the Robert L. Fish Award for best short story by a new American author, E. Gabriel Flores, who traveled with her husband James all the way from Seattle for the occasion. Between the Dell party and the Edgars banquet at the Grand Hyatt, the Dell staff took a half-hour to regroup in the mezzanine bar at Grand Central Terminal (right next-door to the Hyatt). It’s a yearly opportunity to catch up with each other—one of the few times, in this era of telecommuting, that we’re all in the city at the same time. The Edgars banquet was, as usual, a star-studded event, and this year we were especially happy to see Max Allan Collins, an author who has contributed a number of stories to EQMM and who is surely one of the most versatile writers in the business, receive the Grand Master award. Although the short story Edgar did not go to EQMM’s nominee, Joyce Carol Oates, for “The Crawl Space,” it did go to another longtime EQMM contributor, Lawrence Block (for the anthology story “Autumn at the Automat”). And two days after the Edgars, it should be noted, in Los Angeles, “The Crawl Space” won the Bram Stoker Award for Superior Achievement in Short Fiction. I can’t let this account of Edgars week pass without some well wishes to another important EQMM author, multiple EQMM Readers Award winner Jeffery Deaver. The new president of MWA, Jeff was master of ceremonies for this year’s Edgars. When he experienced a health problem during the proceedings, MWA executive vice president Donna Andrews smoothly stepped in and completed the presentation. We soon learned, through a tweet from Jeff himself, that “all is well,” and to everyone who was at the 2017 Edgars banquet that has got to be the night’s best news. Jeff is one of our genre’s most generous and best-loved authors, and we wish him a happy, healthy, and successful year at the helm of MWA. Directly after the Edgars each year, much of the mystery community packs up and heads for the Malice Domestic Convention in Bethesda, Maryland. Unfortunately, due to a transportation delay, I arrived too late to attend the interview of Lifetime Achievement Award winner Charlaine Harris. Charlaine has proved a steadfast friend to our magazine, having most recently contributed a series of stories (that has appeared nowhere else) that forms the basis for the projected NBC TV series Redliners, for which a pilot is currently being filmed. I did manage to catch up with Charlaine and several other of our most valued contributors—Margaret Maron, Dana Cameron, and Toni Kelner—for breakfast on Sunday, however. Tea at the Dell Magazines office. Clockwise from front left: Janet Hutchings, Paul Marks, Eve Allyn, Doug Allyn, Jackie Sherbow, Linda Landrigan. Photo courtesy Paul and Amy Marks. Tea at the Dell Magazines office. From L to R: Jackie Sherbow, Doug Allyn, Linda Landrigan, Janet Hutchings, Paul Marks. Photo courtesy Paul and Amy Marks. On the subway platform: Jackie Sherbow and Paul Marks. Photo courtesy Paul and Amy Marks. At the Mysterious Bookshop party. Photo courtesy Paul and Amy Marks. The Dell Magazines Pre-Edgars party: From L to R: Paul Marks, S.J. Rozan, Doug Allyn. Photo courtesy Paul and Amy Marks. E. Gabriel Flores and Cathy Lazere. Photo by Ché Ryback. Kate Stine and Jim Weikart. Photo by Ché Ryback. Christine Begley, Joshua Bilmes, and Janet Hutchings. Photo by Ché Ryback. Penny Publications/Dell Magazines Publisher Peter Kanter. Photo by Ché Ryback. Joshua Bilmes. Photo by Ché Ryback. Vice President, Penny Publications/Dell Magazines, Christine Begley. Photo by Ché Ryback. L to R foreground, facing front: Sheila Kohler, Peter Hochstein. Photo by Ché Ryback. Analog Science Fiction and Fact Editor, Trevor Quachri. Photo by Ché Ryback. Dell Magazines Editorial Assistant Deanna McLafferty, Kevin Egan. Photo by Ché Ryback. Elizabeth Zelvin and Laura Benedict. Photo by Ché Ryback. Francis M. Nevins, David Dean, and Steve Steinbock. Photo by Ché Ryback. Susan Breen, Gary Cahill. Photo by Ché Ryback. Associate Editor, EQMM and AHMM, Jackie Sherbow. Photo by Ché Ryback. Hilary Davidson, Linda Landrigan, Sarah Weinman. Photo by Ché Ryback. Judy and Dave Zeltserman. Photo by Ché Ryback. Kevin Egan, Shelly Dickson Carr, and William Burton McCormick. Photo by Ché Ryback. Richard Dannay and Cathy Lazere. Photo by Ché Ryback. Gloria Phares and E. Gabriel Flores. Photo by Ché Ryback. Ted and Maggie Hertel. Photo by Ché Ryback. Caroline Todd, Meredith Anthony, Charles Todd. Photo by Ché Ryback. Hilary Davidson and Linda Landrigan. Photo by Ché Ryback. Albert Ashforth, Jonathan Santlofer, Tom Savage. Photo by Ché Ryback. Jim Weikart, Carol Demont, James Peyton. Photo by Ché Ryback. The crowd at the Pre-Edgars Party, General Society of Mechanics and Tradesmen, NYC. Doug Allyn accepts his 2nd and 3rd place EQMM Readers Awards. Photo courtesy Paul and Amy Marks. Paul D Marks accepts the Ellery Queen Readers Award. Photo by Brendan DuBois. Peter Kanter and Paul D. Marks. Photo by Ché Ryback. Paul D. Marks and Doug Allyn. At the Edgar Awards banquet. From L to R: James Peyton, Carol Demont, Linda Landrigan, Steve Steinbock, Abby Browning, Jackie Sherbow. Photo courtesy Paul and Amy Marks. Amy Marks and Jackie Sherbow. Photo courtesy Paul and Amy Marks. Tara Laskowski and Art Taylor with his Agatha Award for Best Short Story. Photo courtesy Art Taylor. Breakfast at Malice Domestic. From L to R: Ann Cleeves, Laurie and Josh Pachter, Art and Dashiell Taylor, Martin Edwards. From L to R: Art Taylor, Dashiell Taylor, Martin Edwards, Helena Edwards, Janet Hutchings, G.M. Malliet, Ann Cleeves, Laurie Pachter. This entry was posted in Awards, Business, Conventions and tagged agents, authors, convention, edgar, editors, malice, mystery week, photos. Bookmark the permalink. We had a great time, Janet! It was good to see everyone, meet new people and explore New York. And, of course, terrific picking up the award. Hopefully we’ll be back to NYC sooner rather than later.